Commercial Real Estate Developer David Genovese gave a presentation to the public at Town Hall (and on TV79) Thursday evening, providing some updates on his proposal to redevelop the triangle between Corbin Drive, the Post Road and Interstate 95. The proposal doesn’t add that much more retail space to the downtown about another 20,000-square feet, Genovese said. And a new street that would run parallel to the Post Road (and that might be extended to Center Street) is something that previous government studies have suggested, he said. David Genovese of Baywater Properties speaking with people just after his presentation in Town Hall. Genovese addressed concerns about underground parking, the addition of a five-story building to downtown, the impact on traffic, and whether the new apartments would increase the school-age population. He mentioned some small changes in the proposal and some other ways the idea might be changed before a formal proposal is presented to town land-use boards. 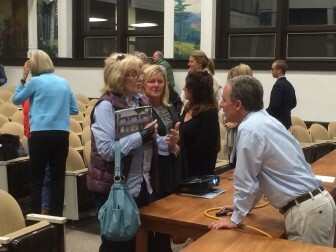 In a meeting attended by about 60 people at Darien Town Hall and covered live on Darien TV79, Genovese also answered questions from the audience, which included a number of people who said they might want to buy one of the condominium apartments in the proposal. With additional housing, retail space and office space in the triangular tract, some people have been concerned about the additional traffic the development would bring to downtown. A traffic study controlled by town officials, along with a study the state can be expected to do, will give a clearer picture on how the development would change traffic in the area, Genovese said. The impact of the new office space on traffic will be minimized a lot by the fact that Darien Railroad Station is the way many office employees already get to and from work, he said. At 8 a.m. downtown, you can see commuters leave the train station, headed toward the office buildings on Tokeneke Road and Old Kings Highway South, he said. He expects the same pattern with workers in the proposed office buildings just a block or so further away from the station. The apartments are meant to be attractive to empty nesters and retirees. Genovese said he expects many of the residents will be living out of state for a large part of the year because of Connecticut’s high estate taxes. The apartments would be condominium units, not rentals, unlike the rental units proposed by the Palmer family and Federal Realty in their downtown Noroton Heights proposals, he said. The units set aside for affordable housing might be rentals, however. The five-story office building in the proposal (to be located roughly where the current Darien Post Office stands) adds enough potential revenue for the development to afford two levels of underground parking under many of the buildings, he said. Building underground parking is very expensive, Genovese said, and without the five-story office building, it would be more difficult to provide parking and provide for the town green-like park about midway between Exit 11 and Corbin Drive, he said. The lowest parking level could be used by people living in the 80 or so apartments that would be built, many of them on the second and third floors of buildings that had stores on the first floor. One factor that increases the cost of underground parking is that the water table is about eight feet beneath the surface in that area, Genovese said. When his company had 1020 Post Road built nearby, the basement had concrete walls three feet thick with reinforced steel to keep the water from seeping in, he said. A building originally proposed to be four stories high at the corner of Corbin Drive and the Post Road will likely be shortened to three stories, so that it won’t be quite as imposing. The building with pillars that was to be a prominent fixture facing the proposed “Market Green” park may look too much like a government structure, so the architectural style may be changed. The architectural styles of the proposed buildings as shown in the sketches already published are at this point just ideas meant to give a feel for what the development might look like. The details can change quite a bit, although the intention will be to design buildings consistent with the best traditions of the town and to keep it looking like a New England community. In order to minimize the disruption to stores that will temporarily be relocated during construction, the stores might move back in on first floors of buildings as work continues on apartments upstairs, Genovese said. The proposed “Mill Road” — a short road that would run between the Post Road and the proposed “Market Lane” might be located farther east than originally proposed. Genovese hopes to get town approval for the redevelopment (which hasn’t been formally submitted for approval yet) sometime in 2016, with construction to start sometime in 2017. It will take about 18 months for the project to be completed, he said, meaning the project wouldn’t end until sometime well into 2018. L.L. Bean would be the anchor store for the development, he said, confirming previous hints he made about the store coming to town. A Westport butcher and a linen shop from Westport have also indicated an interest in moving into space in the development, he said. This is an initial report. Darienite.com will publish more information from the meeting in a later article or a long update to this one. Correction and clarification: Some minor changes have been made to this article at 9:37 a.m., Friday: T he reference to people living part of the year out of state has been changed to “much of the year” from “most” (the correction), the number of apartments from “70 or so” to “80 or so” (a clarification) and a comparison of the additional retail space to the Bank of America building has been removed. Darien Board of Realtors has joined with David Genovese of Baywater Properties to present a public forum about the proposed downtown redevelopment between Corbin Drive, the Post Road and Interstate 95. Titled "A New Vision for Downtown Darien," the informational meeting takes place from 7 to 8:30 p.m., Thursday in Darien Town Hall, 2 Renshaw Road, according to a post on the Darien Board of Realtors Facebook timeline. On Tuesday night, David Genovese offered the Planning and Zoning Commission more details than he previously made public about why his plans for the Corbin/Post Road downtown redevelopment project have changed. The public meeting before the full board follows by about a month the developer's meeting with two members of the commission and officials in the Planning and Zoning Department.